8.02 points at 50 votes (rank 78). As sheriff of Gold Gulch, a small town in the Wild West, the player creates confusion. However, this sheriff doesn't jump over roofs and rolling waggons while shooting around, but first talks before he shoots the gunslingers' nobs. Yes, talking makes up the main part of this game. Per counterpart there are each 3 conversation phases with each 4 pre-formulated answers (+ revolver), so you get a nice number of 64 different possible endings per conversation (if you leave out the premature endings of a conversation). But the plot is not only straight-line - occasionally there are surprises, when an untroubled villain wandering off suddenly decides differently, when the doctor tuns to the bottle instead of patching up the sheriff or when a romance is ahead. 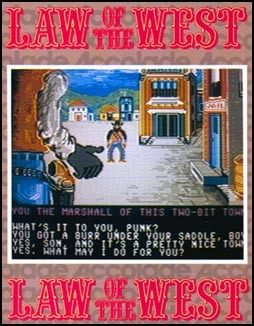 The game also offers the possibility to set the end to the capital flight in Gold Gulch by putting the bank robbers into their place. For the players preferring a little shooting the game offers also some fields of activity, as not every answer gets through the stern test under ethical aspects. 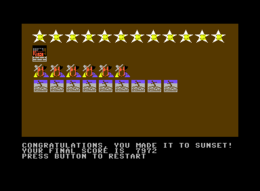 When you play LOTW on an emulator today, an old score is quickly restored - but in 1985/86 it was a tragedy to get shot! This meant turning round the disk and at least 5 minutes waiting before you could start again. A 1985 3D ego shooter! Well, at least there is a front (the sheriff), further in the back (the counterpart) and way back (the guy who scarpers when you pull out the weapon). Here applies: knowledge of foreign languages does pay off. The graphics are detailled, the hip swing of Miss Rose is stimulating and the gallop sound is ingenious, so a great deal of wild west feeling comes up. With joystick in port 2 you can choose the answer, or -if words aren't enough, to express yourself- you can control the crosslines (draw the colt = move the joystick forwards, to fire - press fire). But be careful, the opponents of the duel shoot back. And if you get hit, then only the doc will be able to help you - if he wants to and if he is not drunk! Furthermore you see the achieved number of points at the lower rim of the screen. I've written down my personal solution. To read, try out and supplement. If somebody might notices "Oi, I would do that totally differently! ", just let me know. Already the first gringo in the game wants to tell us, that the James Gang wants to rob the train. You the sheriff of this stinkin' town? >Yes. What may i do for you?< You must be the nicest lawman alive. >The last man that said that to me died.< Well, Sir, i didn't mean any offence. >Good. Heard any news about the Daltons?< The James gang is goin' to rob the train. Miss Rose also gets a few things in the saloon. Well, hello there, big boy. >How's the saloon business doin' lately?< Business is fine, except for the Daltons. >Are they planning something?< Well, I really shouldn't tell ya, Sheriff. >It's ok, Rose. I'll protect you.< Ok. They're gonna rob the stage. The third guy wants to know it! Eh, Gringo, I heard you got a fast draw! >Say, aren't you the mexicali kid?< Si, some call me that. >There's a price on your head, I bet!< Si. But you will never take me alive! >Drop your gun or else!< No! The doctor cannot only rescue life, but he can also baffle crimes. Kill any more people lately, sheriff? >I try to avoid gunfights, if possible.< You sure wind up with your share. >Heard any good rumors lately?< Yeah. The Daltons were comin' to town. >What are they comin' for?< I hear they're gonna rob the bank. This fight is easy to avoid. But why let a villain go? Sheriff, how do you like my new shotgun? >Gee, is that the new Remington ten guage?< It shore is. Ain't it a beaut? >Yep. Wish I had me one.< It cost me twenty dollars. >How'd you ever get that much money?< By robbin' people like this! I've got a secret I won't tell! >Hey, Willie, would you like some candy?< Gee, thanks, Sheriff! >Can we talk, Willie?< Sure, Sheriff. I like talkin' with you. >Good. Now, what's your secret?< They're gonna rob the bank. For a change there is no shooting around. You can either let the fraud go or hunt him down. Watch out! In this solution it looks as if the gambler JUST wants to go back to the saloon. But always keep your gun ready. Those boys sure can't play poker. >Gamblin' is the devil's way to poverty.< Maybe for some, but it's very good for me. >May the lord have mercy on you.< Me? What about you? They pay you to kill! >I try to avoid gunfights if possible.< What a sissy. I bet you do. Today, the deputy does not cry a wolf. Where the heck you been, Sheriff? >Why? What's up?< I think we're in for some trouble. >I'm tired of your false alarms.< But, Sheriff, this is important. >Ok. What is it?< Someone's robbin' the Bank! Many ways lead to a shooting with Miss Belle. But there is an alternative! Well, if it ain't the tinhorn Sheriff. >Doin' any more cattle rustlin', woman?< A woman's got to make livin'. >Do you have to do it illegally?< It's tough for a woman on the frontier. >It's tough for anyone alone out here.< I think maybe we could get together. It doesn't have to be a date. There is another possibility to make a friend with Belle. But I could not see a difference in the points. Well, if it ain't the tinhorn Sheriff. >Howdy, Belle. Nice seein' you again.< That wasn't your attitude last time. >Well, you was rustlin' cattle at the time.< I guess i was in the wrong. >Can we be friends?< Yes, I'd really like that. You're the Sheriff here, aren't you? >Those are mean lookin' guns you have.< Yeah. And I'm pretty mean myself. >You sure do look tough.< You'll soon find yout exactly how tough. >I don't need to fight you.< You got no choice. Draw! That's it! For today the sheriff has sniffed enough gun powder. Closing time! - "Yes. What may I do for you?" - "Sorry, Ma´am. I was just preoccupied." - "Just tell me what you have to say." 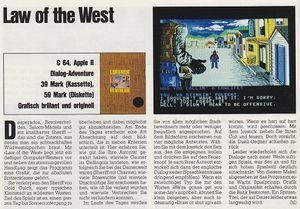 "Critics in Happy Computer 4/86"
Sledgie: "As player on an emulator I have at the moment some problems in aiming. The dialogues are ingenious. Altogether Law of the West is a game that I will probably play more often. 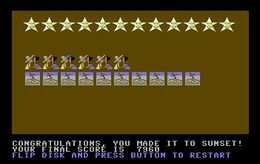 For me it is one of the highlights of C64 games, therefore I give full 10 points." Guybrush: "A cool game that hardly gets boring due to the many options you can choose from, great graphics, good sound, 10 points." mombasajoe: "Nice atmosphere. Even after 20 years I search out this game every now and then. But I don't want to give it more than 7 points. You just memorize the different dialogues far to quick. There is a lack of diversification." 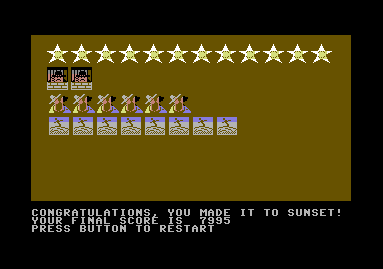 Shakermaker303: "Great Wild West game, a cowboy feeling arises. Now you also know how people cursed and vituperated in the Wild West. Small minus point for the long loading and waiting time and the flipping of the 5 1/4 disks - but the waiting pays off. Therefore 10/10." This page was last modified on 14 June 2016, at 21:17.